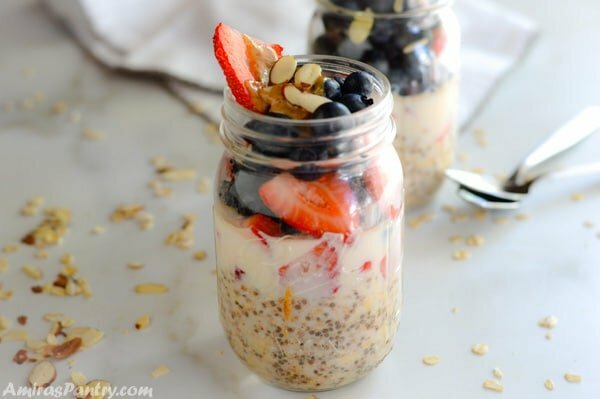 Overnight oatmeal in a jar for a hearty, healthy, make ahead breakfast. How cool is that?. 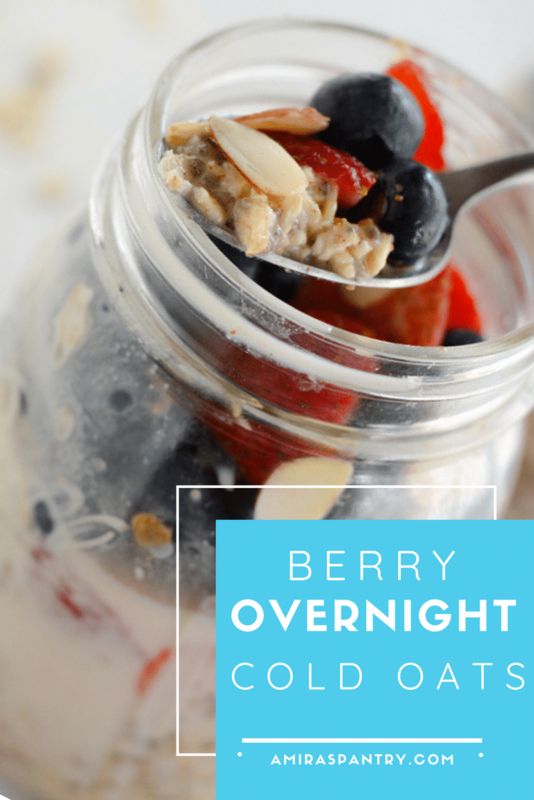 Berry overnight oats will make your mornings a breeze. This is the right start for a great day. Also try this basic scones recipe with your favorite add-ons . Start the day with oats and berries has never been easier. Just throw a handful of ingredients in a jar at night and BOOM here you have it to ease your mornings. I love make ahead recipes, or breakfasts that you can throw in your slow cooker the night before, like this amazing bread pudding. Schools are back, what does that mean? it means crazy mornings, and afternoons as well. No time to prepare anything specially in mornings. Eating healthy when time is short is not an easy task. 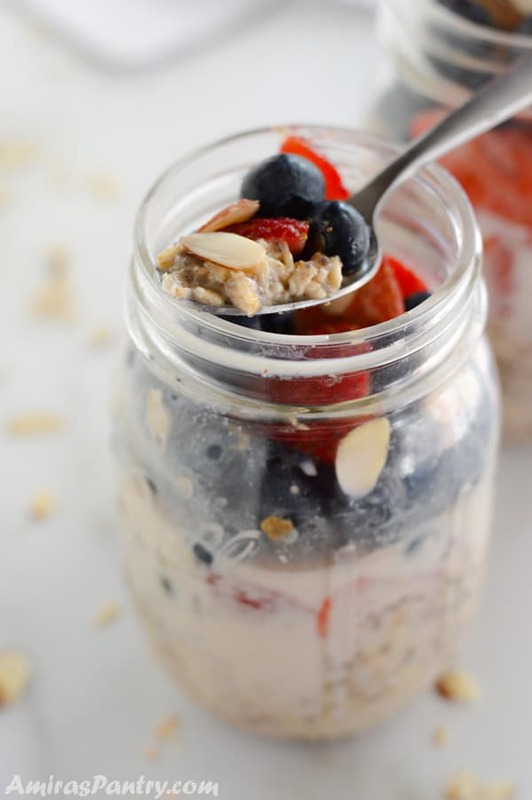 Overnight oats with strawberries and blueberries has it all, tasty, looking fresh and colorful and healthy. 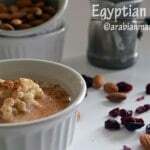 Can you use old fashioned oats in overnight oats? Yes, sure. 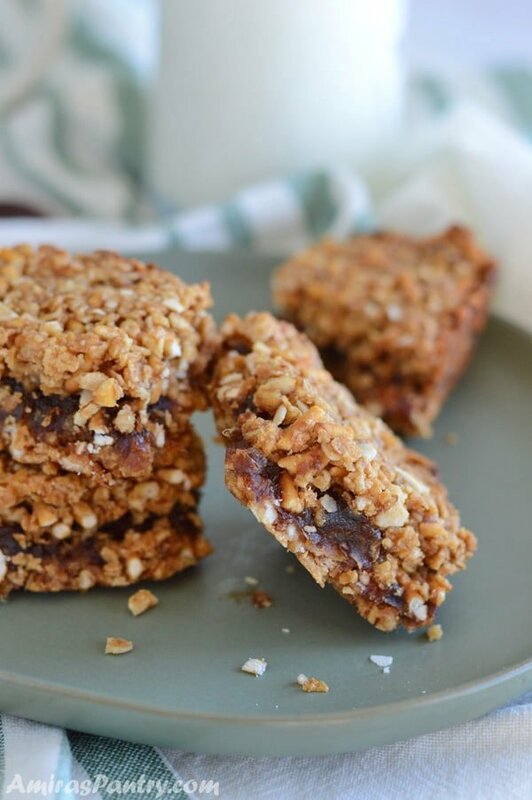 Actually, it is traditionally made with old fashioned rolled oats. 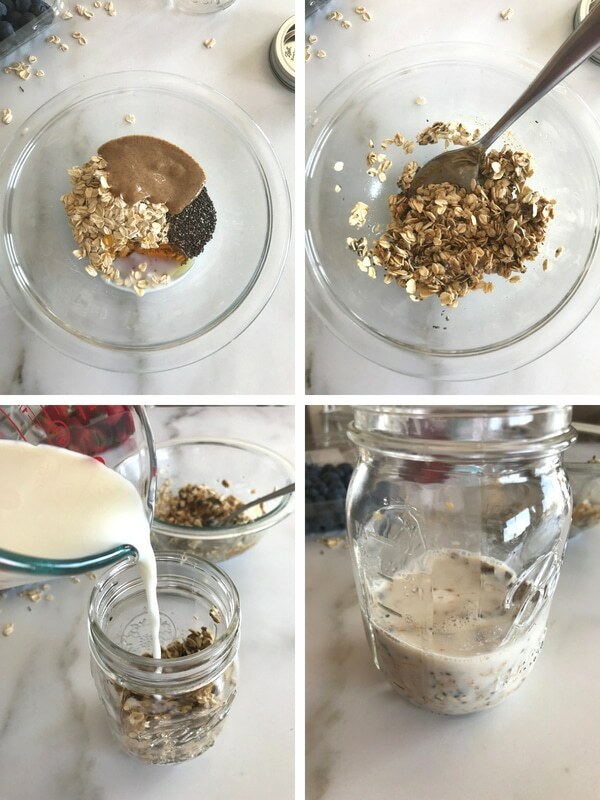 Can you use instant oats for overnight oats? Instant oats will get you overnight oats recipe in just 30 minutes or less. So if you are looking for soaking and leaving overnight thing, use the good old fashioned oats. Of course. If you are not a fan of milk or want it dairy free use whatever. You can use, any sort of milk like almond cashew, you can use juice or water whatever you are comfortable with. 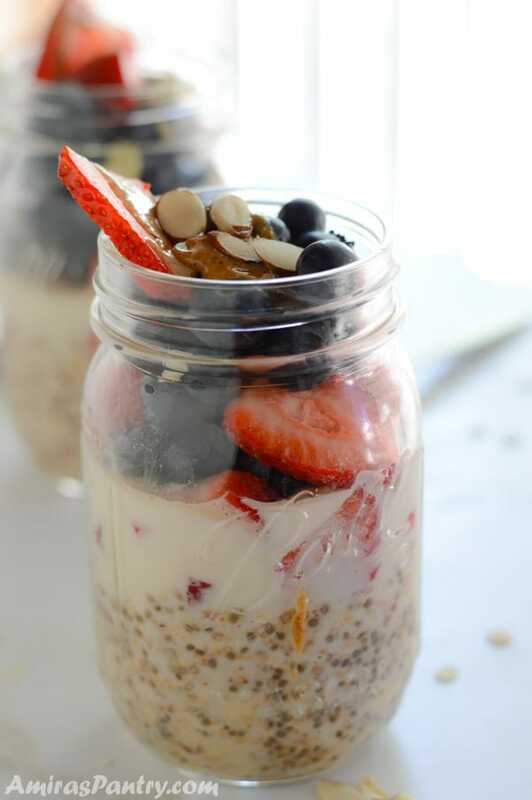 Can you use frozen berries in overnight oats? I love using fresh berries, but yes you can use frozen berries. In fact, some people find it easier to use the frozen, especially if you are aiming for organic. Organic frozen are always cheaper than fresh and you do not have to panic and use them quickly before they go bad. 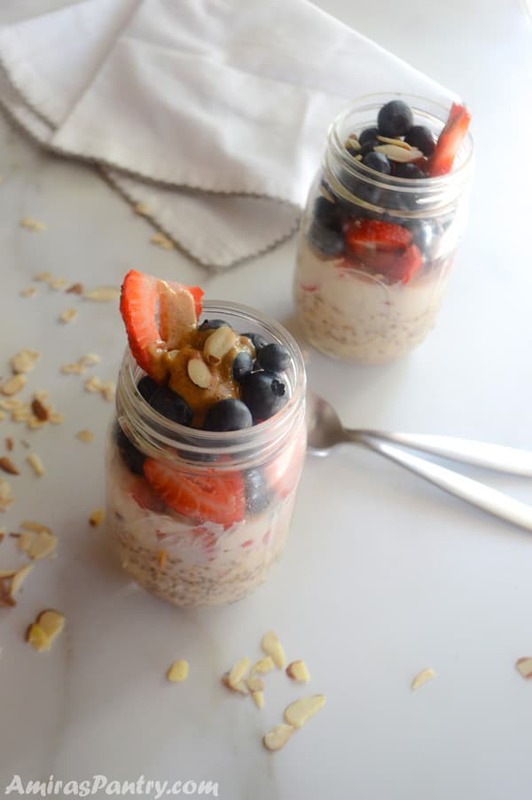 Overnight oats can last up to 5 days in the fridge. That’s 5 days of ready breakfasts waiting for you in your own fridge!. Gather the ingredients, see how they are colorful and refreshing just by looking. I’ve used only milk in this recipe, some people though like adding yogurt. I am not a huge fan of yogurt so I limited it to only milk. I’ve also used almond butter, love this thing. But obviously, you can use any nut butter of your choice. Chia seeds: If there is one ingredient that I want to include in every meal, it would be chia seeds. These little seeds are packed with fibers, omega3 and can soak up to 5 times their size in liquids. This is return fills you up quickly for less calories. I love mixing in a bowl first, It is easier for me to mix in a bowl than the jar itself. So in a bowl, mix oats,honey, almond butter, chia seeds and two tablespoons of milk together. Transfer mixture into 14-16 oz Mason jar, add milk. Stir well, cover and refrigerate overnight. I like adding my fruits before eating but you are welcome to add them before closing the lid. If you are using apples or banana slices add them just before eating to prevent browning. And that’s pretty much it. 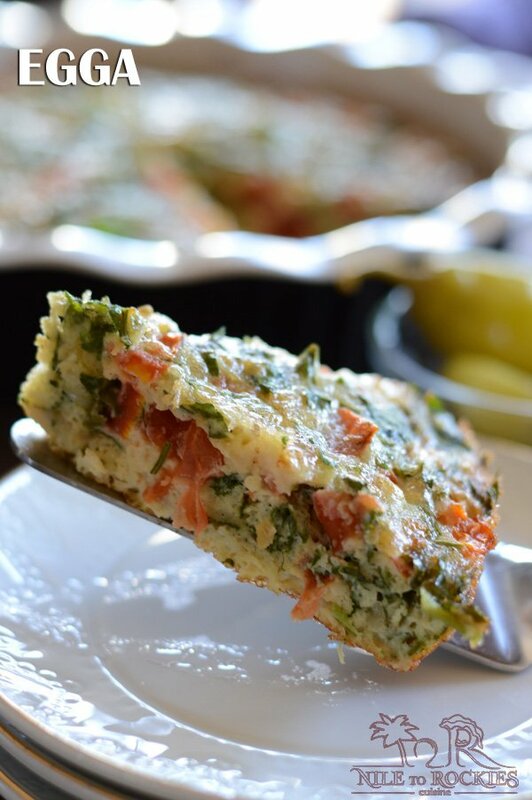 You just need to go to sleep and wake up to a yummy, filling, protein-and-fiber-packed breakfast. I would like to take the opportunity and thank the genius who came up with this idea. Just think of all the varieties you can come up with, add protein powder for more protein or just add some almonds along with the fruits. Brighten your day with this delicious breakfast. Get creative with the first and most important meal of the day. 1/2 cup old fashioned rolled oats. 1 Tablespoon creamy almond butter. 2 teaspoon honey or maple syrup. 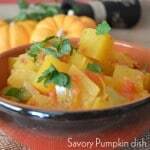 1/2 cup milk or up to 2/3 cup for a thinner consistency. 1/2 cup berries or fruit of your choice. In a 14-16 oz jar or in a bowl add first 5 ingredients with 2 Tablespoons of milk and mix well to combine. Pour in the rest of the milk and stir. Serve chilled with more honey if you would like to. * I like adding fruit when ready to serve. Also if you use apple or banana slices do not put them until you are ready to serve. ** Can be kept in refrigerator for up to 5 days. Oh, yum! These look terrific. 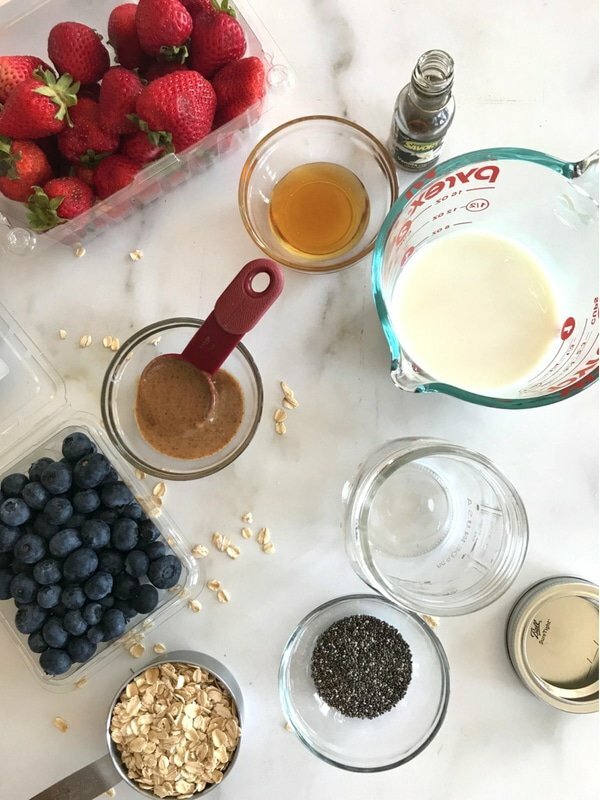 Best overnight oats I’ve ever seen — thanks! Thank you John, it helps so much in our crazy mornings :). Absolutely. 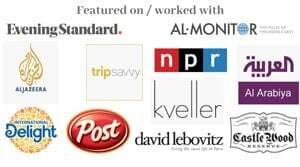 Here are some that come to mind. 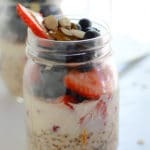 For breakfast: Overnight oats/steel cut oats with chia seeds or sprinkle flax seeds or hemp seeds and fresh fruit for fiber. I make paleo pancakes fat + protein or scramble egg and sneak in a little spinach or kale. For lunch: Black bean “burger patty or normal burger patty (I sneak in veggies into the burger) and serve it with extra avocado on some days. Most meats will have a fat and protein combo, but we want to up the healthy fats in our diets. Avocado, fish, nuts, seeds, coconut etc. My toddler loves dipping at the moment, so I make him some mashed avocado/ guacamole (fat) or hummus (protein) with some veggies as a snack or “starter Snacks: I make nut and seeds clusters with a little raw honey/maple syrup and tamari. It”s a great travel snack. Fresh berries with hemp seeds. Smoothies with coconut milk (fat) and greens (they have protein) and blueberries and banana. Love all your suggestions Salma, thank you for being so helpful to all of us here. 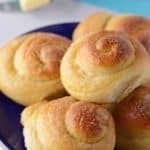 I am sure many will love to try your recipes. That looks amazing. Porridge and berries are two of my favourites. Tastes amazing as well, hope you’ll try it out Alex.